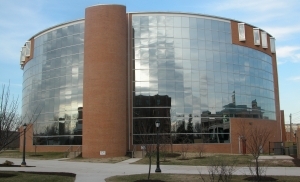 Delaware State University is a public historically black university with its main campus in Dover and two other campuses in Wilmington and Georgetown. The school was established in 1891 as State College for Colored Students after passage of the Morrill Act of 1890 which gave land-grants to establish public colleges for African Americans. Like many of the other schools designed under the Morrill Act, the college was racially segregated and focused mainly on teacher and agricultural training. The campus opened in 1892 and initially did not offer degrees but instead allowed students to study five majors leading to a baccalaureate degree. Five years later, the school established a program leading to a teacher’s certificate, and the first class of certified teacher candidates graduated in May 1898. After the beginning of the 20th century, courses also were offered in agriculture, mechanic arts, and domestic arts. Baccalaureate programs were first offered in 1932. In 1944, the Middle States Commission on Higher Education granted provisional accreditation to the college but revoked it five years later. Delaware State gain full accreditation again in April 1957. In 1947 the institution changed its name to Delaware State College, and in 1993 it became Delaware State University. With a student population that averages around 3,700 (three quarters of which are African American), Delaware State University currently offers more than 50 undergraduate degrees, 23 master’s degrees, and five doctorate degrees. The Delaware State Hornets compete in the National Collegiate Athletic Association’s (NCAA) Division I. In 2009, US News and World Report ranked the school as number 17 under the “Best Historically Black College and University” category. Henry N. Drewry and Humphrey Doermann in collaboration with Susan H. Anderson, Stand and Prosper: Private Black Colleges and Their Students (New Jersey: Princeton University Press, 2001); http://www.desu.edu/history; http://colleges.usnews.rankingsandreviews.com/best-colleges/hbcu-rankings; http://www.msnbc.msn.com/id/20957758/; http://www.dsuhornets.com/.